Send more . . . Archetypes? Ever had a new player show up without a character? Ever needed a new party fast since zombies munched down on the old one? Ever needed instant characters for a pick-up game, because no one wanted to bother with char gen? Eden Studios has the book for you! 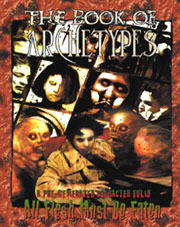 Take your love of flesh to the next level with the AFMBE Book of Archetypes. • More than 35 new Archetypes to throw into the zombie survival horror meat grinder. • Each Archetype includes personality, quote, gear, and full game stats. • Several new Qualities, Drawbacks, and pieces of equipment for Cast Members. © Eden Studios 1998 – 2010. All rights reserved. ALL FLESH MUST BE EATEN, BEYOND HUMAN, EDEN STUDIOS PRESENTS, TERRA PRIMATE, ABDUCTION © Eden Studios, Inc. All Rights Reserved. BUFFY THE VAMPIRE SLAYER™and ANGEL™ © Twentieth Century Fox Film Corporation. All Rights Reserved. Used under license. ARMY OF DARKNESS™ © Orion Pictures Corporation. All Rights Reserved. Used under license. ARMAGEDDON: THE END TIMES, WITCHCRAFT and UNISYSTEM © CJ Carella. All Rights Reserved. Used under license. GHOSTS OF ALBION © Amber Benson and Christopher Golden. All Rights Reserved. Used under license. KNIGHTS OF THE DINNER TABLE™ © Kenzer and Company. All Rights Reserved. Used under license. CONSPIRACY X © George Vasilakos. All Rights Reserved. Used under license.